The statement was drafted shortly before Ukrainian politician Yulia Tymoshenko briefed a group of conservative leaders including German chancellor Angela Merkel, Polish Prime Minister Donald Tusk and Spanish Prime Minister Mariano Rajoy about the crisis in her country. If issued without change, it would send a strong signal of defiance at Russia's intervention in Ukraine, said one person familiar with its preparation. Another emphasised, however, that the issue remained 'delicate'. "To say this at this moment in time, when the country is under threat of being annexed, shows that the place for Ukraine is in the West and not in Russia. Although not legally new, it is symbolically strong," said one person familiar with EPP thinking, who asked not to be named. The EPP is the strongest family in European politics. It is the biggest single group with a dozen heads of state and government in 28-member bloc and the largest number of lawmakers in the European Parliament. In the statement seen by Reuters, entitled an emergency resolution on Ukraine, the EPP said the law that envisaged countries joining the European Union "refers to all European states, including Ukraine, which has a European perspective, and may apply to become a member of the Union." Earlier on Thursday (6 March), EU leaders agreed to suspend visa and investment talks with Russia in reaction to its seizure of Ukraine's Crimean Peninsula, and said they would freeze Russian assets and withdraw from a G8 summit if Moscow does not reverse course. The action was more far-reaching than expected, spurred in part by a decision of the parliament in Crimea, which has an ethnic Russian majority and has effectively been seized by Russian forces, to join Russia. 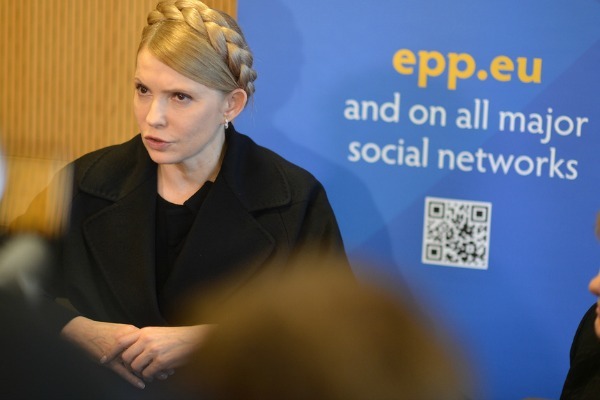 Speaking in Dublin at the meeting of EPP members, Tymoshenko called for Europe to take strong action over Crimea's attempt to join Russia, warning that otherwise Moscow would attempt to take over the rest of Ukraine. Tymoshenko, twice Ukrainian prime minister and one of the favourites to become its next president, said Ukraine was too weak to stand up to Moscow alone. Speaking two weeks after she was released from prison following the collapse of the government of former President Viktor Yanukovich, she also said Ukraine still hoped to sign an association agreement with the EU. "I very much hope that before or after the presidential elections (on May 25) we will sign an association agreement with the European Union," she said. Pro-Russian Yanukovich was toppled in February after three months of protests triggered by his refusal to sign the association agreement with the EU in November. The European Union has so far refrained from giving Ukraine a clear perspective of accession to the bloc. The EU’s proposed Association Agreement (AA) with Ukraine, rejected in November by the country’s ousted President Viktor Yanukovich, stopped short of discussing the perspective of bloc membership in the EU-Ukraine relationship. Poland, Lithuania and Estonia have repeatedly called for a more flexible EU policy vis-à-vis Ukraine and take the view that Kyiv should be offered a clear perspective for EU accession. Germany, however, has been reluctant to go that far, seeing this as an unnecessary provocation towards Russia, which sees Ukraine as belonging to Moscow’s sphere of influence. They offered Turkey the same deal and look how that has turned out.